A Wholesome Nutritious Weight Gaining Health Mix. Starting your baby on solids? Looking for nutrition packed, weight gaining food that is also easy to prepare? 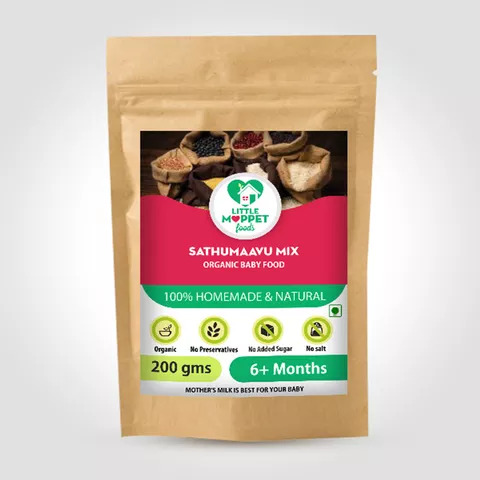 Little Moppet Food s SathuMaavu Health Mix is the perfect weight gaining food for your baby, made with over 12 natural ingredients. An outstanding source of nutrition, SathuMaavu has been trusted by generations of Indian parents. Now you can give your baby this unbeatable nourishment without spending time and effort in the kitchen! Mix 2 tablespoon of SathuMaavu powder with 2 cups water without lumps. . Cook the mixture on medium flame for atleast 10 minutes. Fruit Purees can be added to the porridge to make it sweet.